Nurses are trusted messengers of health information and have the opportunity to influence policy at all levels of government. There are almost 4 million nurses in the United States and when nurses advocate for environmental and public health, we can make a difference. Use the facts: Any position you take should be grounded in the facts. Engage the public: Use the media, social media, petitions, letters, e-mails and other grassroots strategies to engage as many as you can. Make your voice heard—through meetings with government officials, press conferences, letters, petitions, rallies, and phone calls. 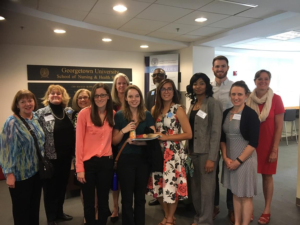 As part of ANHE’s June 2017 Climate Change, Health, and Nursing: A Call to Action conference, 25 nurses participated in an advocacy day to talk with federal representatives about climate change and health and to advocate for advancement of climate solutions that prioritize health. Check out ANHE’s blog post on the conference. Additionally, Fiona Armstrong, nurse and founder and executive director of the Climate and Health Alliance in Australia (CAHA), has been leading by assisting in the advancement and implementation of a national strategy on climate and health for Australia through the development of a policy framework. To accompany the policy framework, CAHA developed a Discussion Paper that provides an overview of climate and health impacts in Australia, review of current national policies, an assessment of limitations and gaps in policies, and proposes the thematic framework for the Strategy which includes six key action areas. View the discussion paper here. Catholic Climate Covenant has general resources of how to write a letter to the editor or opinion editorial, along with how to set up a meeting with your legislator. American Nurses Association article on advocating for nurses and nursing advocacy resources for nurses. That National League of Nursing developed a list of web-based resources for public policy advocacy.